New cloud-based software will allow administrators to make decisions on all 11 campuses more effectively. 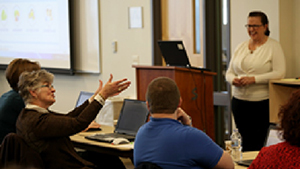 Planners from 11 campuses in the North Dakota University System attended a workshop earlier this year on how to effectively use the new Strategic Planning Online system. The North Dakota University System is adopting new cloud-based software that will allow it to streamline strategic planning for its 11 campuses. The university started training sessions earlier this year on how to take best advantage of the Strategic Planning Online (SPOL) software that is expected to help staff members and other stakeholders better incorporate strategic planning, budgeting, assessment, program review, credentialing and accreditation all at once. SPOL offers a "unified collaborative environment for holistic continuous improvement, providing a framework to support the core requirements associated with accreditation standards and other regulations," according to the company. The North Dakota University System includes four regional universities, five community colleges and two research institutions. It has not always been possible for systemwide administrators and government policymakers to have immediate access to information they need to make decisions. The new software will help staffers coordinate their strategic planning efforts and resource allocation with assessment and accreditation, both on individual campuses and across the entire system. "We believe it would be tremendously advantageous for us to be able to access this and pull up data during board meetings or legislative hearings," said Vice Chancellor of Strategic Assessment Linda Donlin. "This could provide updated, real-time measurements of where we are as campuses and as a system in relation to our goals."